The Koninklijke Bibliotheek, National Library of the Netherlands, has discovered in its holdings five books from the private library of Oscar Wilde (1854-1900). Five seems a small number, however, up to now, only 42 books from Wilde's library were known to have survived in public collections. Almost 3.000 have never been located. Oscar Wilde knew quite a few modern artists and writers in England as well as in France, and he received dedication copies for his beautifully designed library in London. He also bought great numbers of foreign language books, particularly French, from several London booksellers. 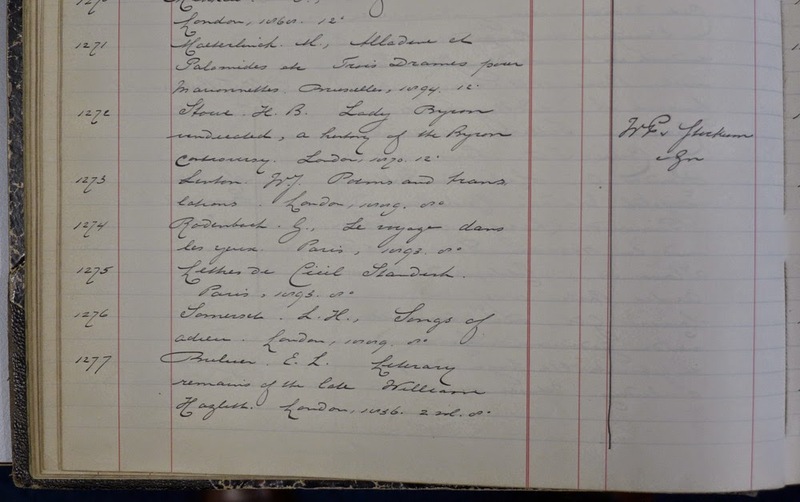 Wilde's arrest on 4 April 1895 immediately affected his library. On 25 May Wilde was convicted for homosexual acts (gross indecency) and sent to jail. In the meantime, his library was sold in public. Early April, his creditors demanded to be paid, which resulted in Wilde's bankruptcy. His assets were seized, and an auction took place at his house in Tite Street, Chelsea. On 24 April books from his library, paintings, even some children's toys were sold. Books were bound together randomly and hastily sold from the bow window of his ground floor library. 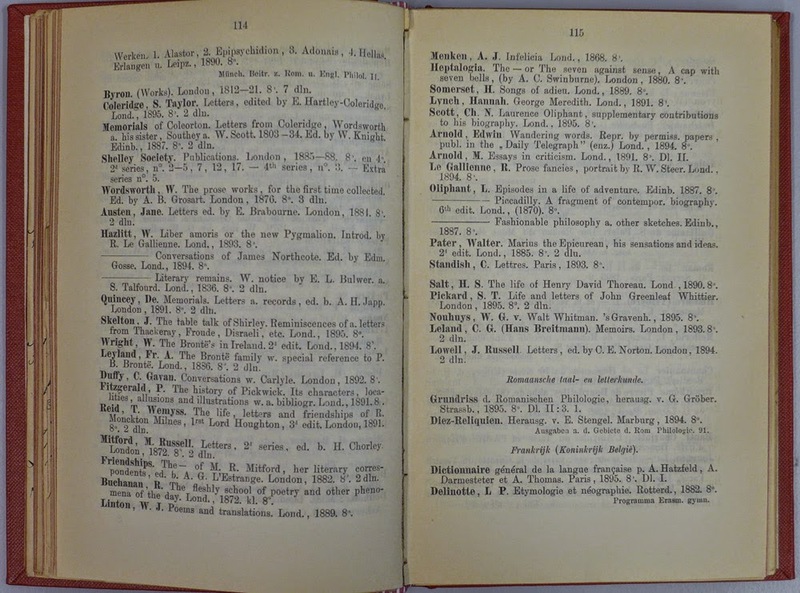 The auction catalogue shows that his books were sold together in bulky lots, and most of the catalogue descriptions are rather vague, which today makes it almost impossible to determine whether a book has been part of his library. 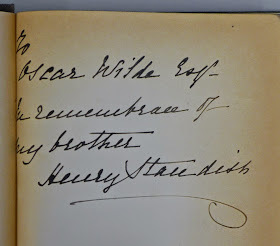 Copies with extensive notes in his handwriting are more easily recognizable. 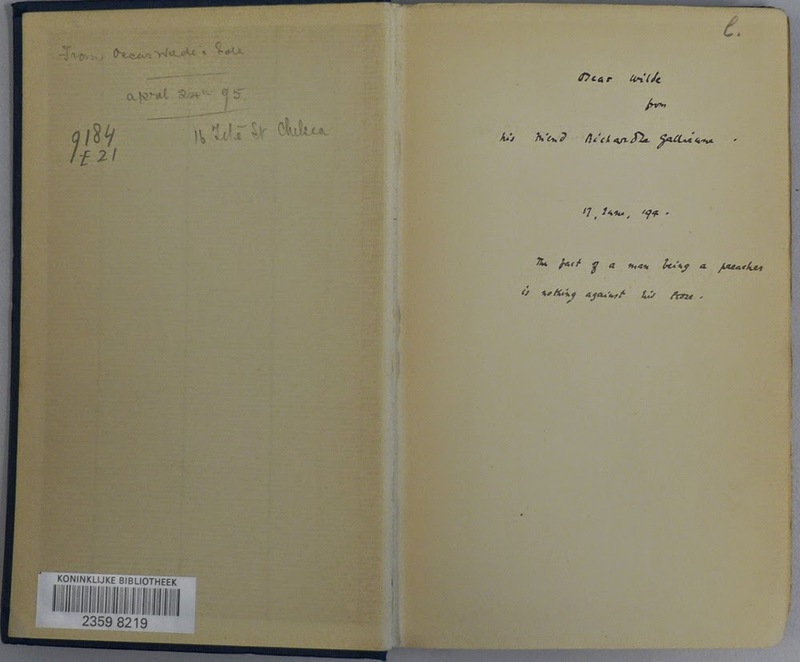 Dedication copies have often been damaged, due to the scandal surrounding Wilde's trial a month later (25 May 1895). New owners erased inscriptions from the books to avoid any connection with the now notorious author. 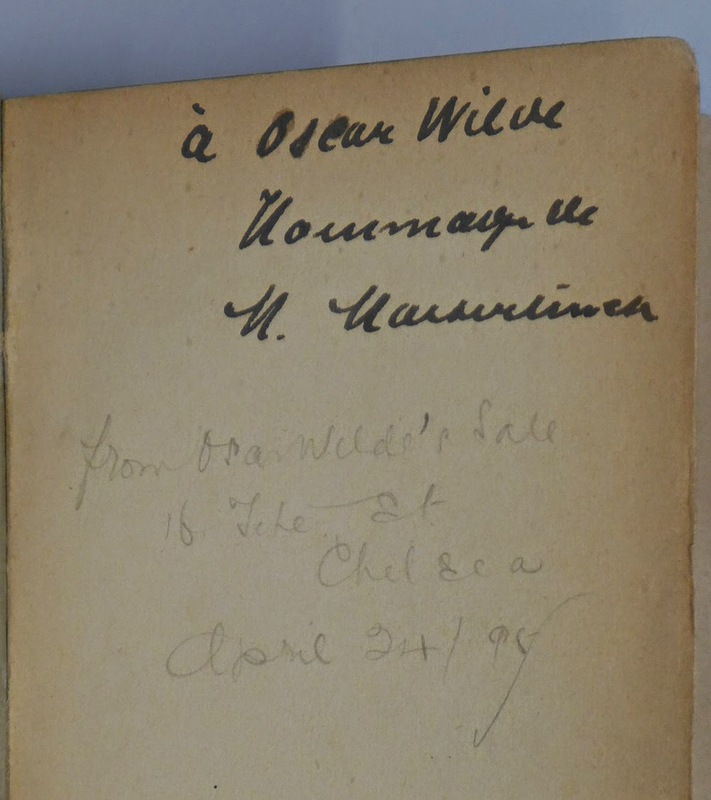 Many association copies have been mutilated and can not be traced back to Wilde's collection. Parcels of books were sold for small sums of money, mainly to dealers, and in no time his books were distributed over the many book stalls and shops in London. Wilde's library with all its literary connotations had been destroyed. Therefore, it is remarkable that the National Library of the Netherlands can state with certainty that five books have belonged to Wilde's library. 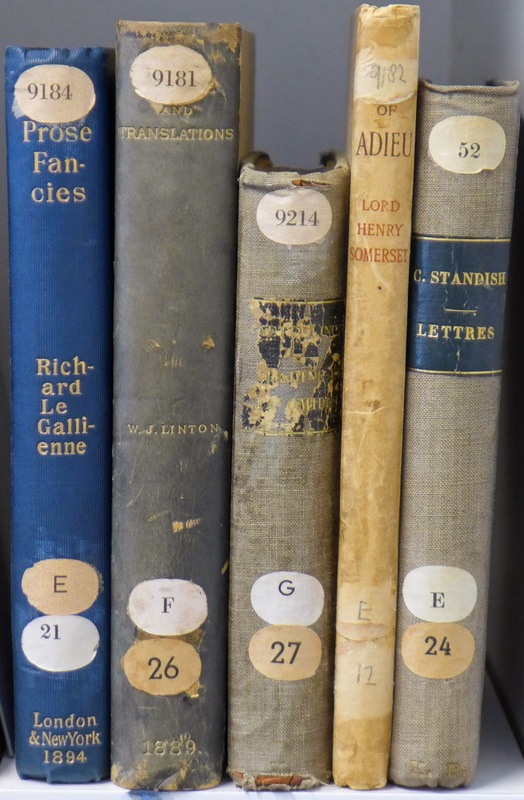 Three of these books are dedication copies, given to Oscar Wilde, and two others bear a handwritten note stating the provenance. Lettres de Cecil Standish. Paris, Alphonse Lemerre, 1893. Copy no. 136 of 250 numbered copies. 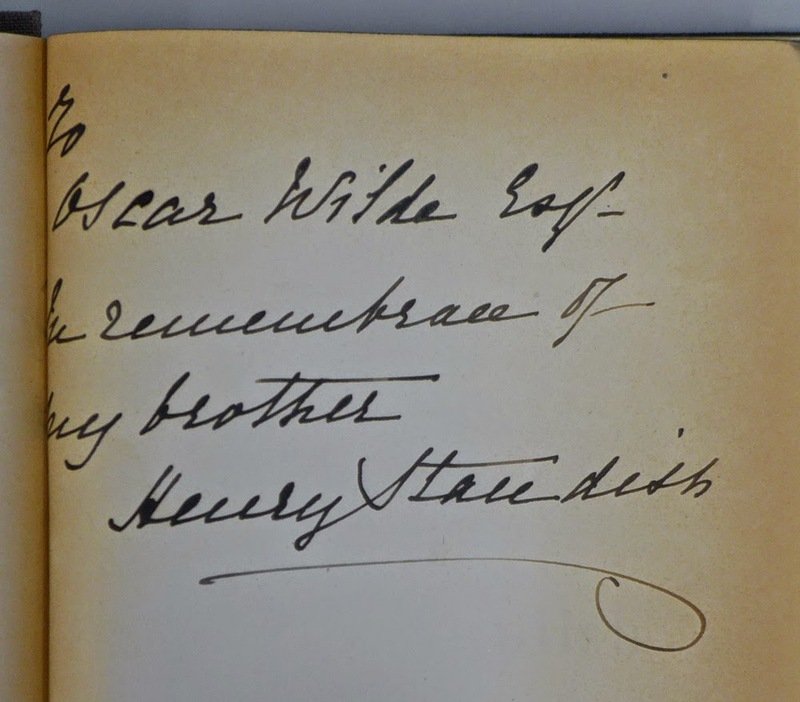 With handwritten dedication by Henry Standish: ‘To Oscar Wilde Esq. In remembrance of my brother, Henry Standish’. Maurice Maeterlinck. Alladine et Polomides, Intérieur, et La Mort de Tintagiles. Bruxelles, Edmond Deman, 1894. 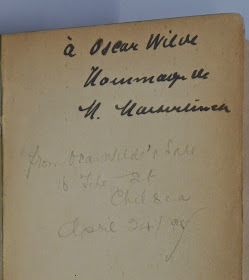 With handwritten dedication: ‘à Oscar Wilde Hommage de M. Maeterlinck’. Below the dedication is a note in pencil: ‘from Oscar Wilde’s Sale 16 Tite St. Chelsea April 24 / ’95’. Richard Le Gallienne, Prose Fancies. London, Elkin Mathews & John Lane, 1894. With handwritten dedication by Richard Le Gallienne: ‘Oscar Wilde from his friend Richard Le Gallienne. 17, June, ’94. The fact of a man being a preacher is nothing against his Prose’. Facing this page is a note in pencil: ‘From Oscar Wilde’s Sale April 24th, ’95 16 Tite St. Chelsea’. Lord Henry Somerset. Songs of Adieu. London, Chatto & Windus, 1889. On the endleave is a note in pencil: ‘From Oscar Wilde’s Sale 16 Tite St Chelsea April 24th 1895’. W.J. Linton, Poems and Translations. London, John C. Nimmo, 1889. No. 280 of 780 numbered copies. On the endleave is a note in pencil: ‘From Oscar Wilde’s Sale 16 Tite Street Chelsea April 24th 1895’. The five books are contemporary literary works. The Maeterlinck dedication is not very personal, although the relation between Wilde and Maeterlinck was of consequence. The dedication from Richard Le Gallienne is the longest. Wilde did not make any notes in these books. Two of them - Maeterlinck and Standish - have been bound by the National Library after they were acquired. The fascinating provenances were not recorded in the library's catalogue. I discovered the first book by accident, and the others after extended provenance research. For an essay about limited editions, I needed a column written by Richard Le Gallienne, 'The Philosophy of "Limited Editions"'. It discusses the craze for bibliophile publications in the early eighteen-nineties, Wilde's years of glory. 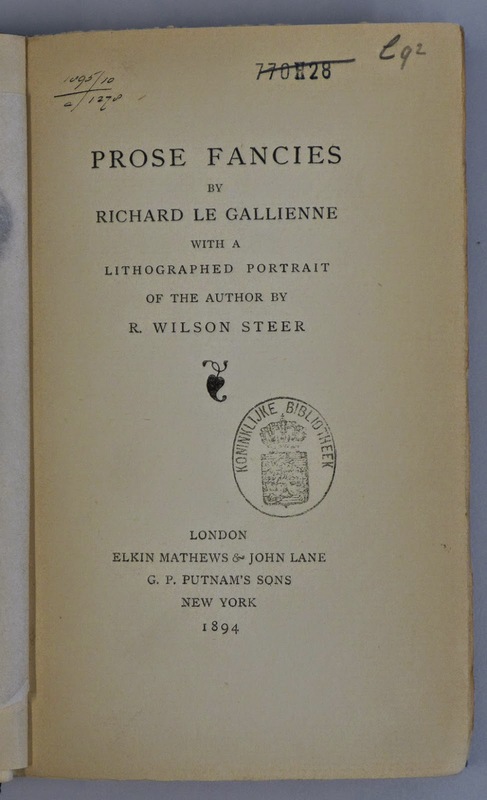 Le Gallienne, now a forgotten poet, shared a publisher with Wilde, The Bodley Head. When I opened the book I was amazed to see a written dedication to Oscar Wilde. Moreover, from the title page I could deduct that the library had bought the book in 1895, the year of Wilde's disgrace. The acquisition note mentions the year and month, October 1895: '1895 / 10 / a / 1278'. This was the 1278th book that was acquired by the library in 1895. The note enabled me to search for books that were bought at the same time, having the same provenance. 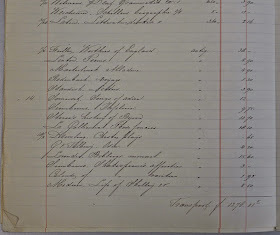 The archive of the library contains the acquisition ledger for 1895, showing that on the same date ten books were acquired from the same dealer. These were registered on 10 October 1895 from antiquarian book dealer W.P. van Stockum in The Hague. 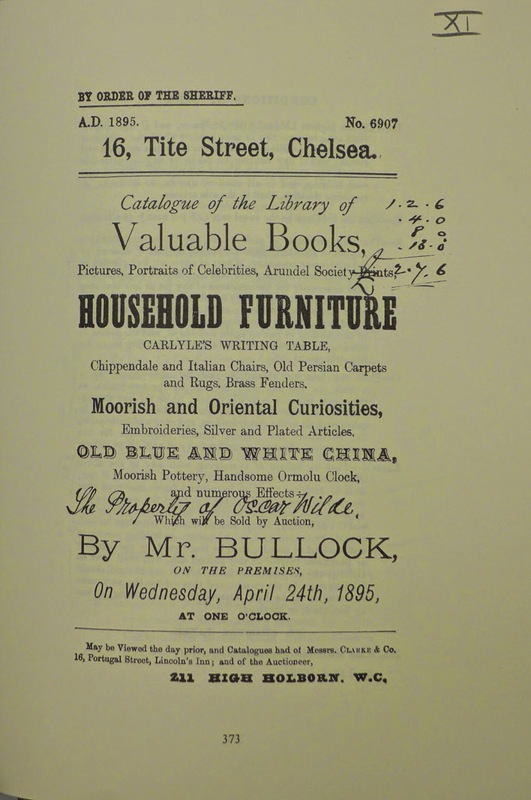 (The municipal archive contains some material concerning this bookseller and auction house, but nothing about 1895.) A printed catalogue - from which the works may have been selected - has not been preserved. We can not ascertain where Van Stockum had originally acquired the books. However, five of the ten books that were bought on 10 October show evidence of the Wilde provenance. The other five may have belonged to his library as well, but there is no evidence, and it is not likely. The books were not acquired for their association with Wilde, - who by that time had been imprisoned, and had fallen out of favour - they served to enrich the library's collection of English literature. 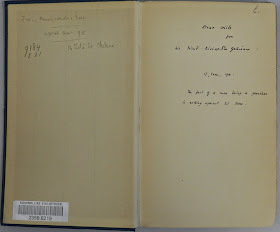 I examined more than ten books, of course, in fact I requested to see huge piles of other books that had been bought since April 1895, but alas, I did not find more books from Wilde's library. 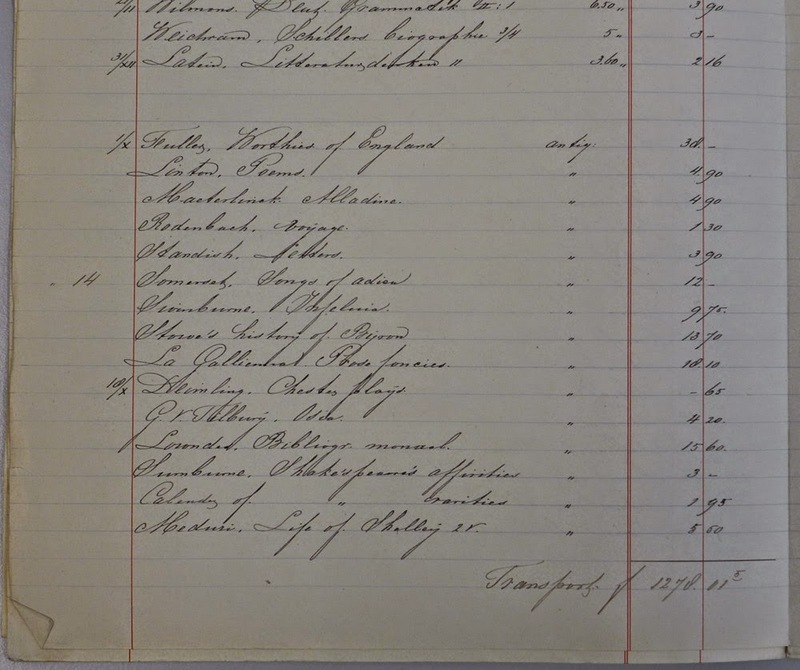 The invoice was settled early 1896, and shows that the prices varied greatly. Standish was priced at ƒ 3,90, Linton and Maeterlinck each at ƒ 4,90, Somerset ƒ 12,00 and Le Gallienne ƒ 18,10. The highest price was paid for the most recently published book by a popular author - on 11 January 1894 the Dutch newspaper Algemeen Handelsblad had called Le Gallienne 'een der beste Engelsche dichters' (one of the best English poets). 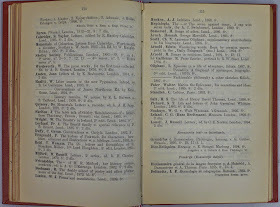 The annual report of the National Library (Verslag over den toestand der Koninklijke Bibliotheek in het jaar 1895, published 1896), duly mentioned the acquisitions in the section of English language studies and literature, but did not quote the provenance. 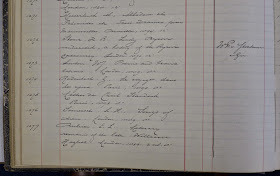 The same goes for the card catalogue, and this reflects that the provenance was not considered important at the time. Nowadays, more than a hundred years later, the Oscar Wilde provenance of these books is seen as a remarkable and interesting feature. They are the testimony of his literary and social relations. The five books will be moved to the rare book department.